Get ready to rock and celebrate the release of Net Entertainment’s most exciting new game, Motorhead, with LeoVegas.com who are giving mobile players the ultimate bonus package. The online game is based on the British hard rock band and features Motorhead’s eccentric and larger than life front man, Lemmy Kilmister, who passed away in 2015. The Motorhead pokie is the third and final instalment in the NetEnt Rocks trilogy which also includes Guns N’Roses and Jimi Hendrix, both of which have proven to be incredibly popular due to their top-notch graphics, awesome soundtracks and exhilarating bonus features. Leading online casino LeoVegas are now launching a massive promotion, giving away free spins and $100,000 in cash and prizes as well as the chance to win every rocker’s dream prize, a guitar signed by the legendary Lemmy. For every $10 you deposit and play through between September 22 and October 24 you will get a ticket into the draw to win the guitar signed by Lemmy. Players can also gain extra tickets in the draw by heading to the exclusive LeoVegas Celebrity Blackjack Party table – all you have to do then is wait for the croupier to deal you an Ace of Spades. Each player who is dealt an Ace of Spades automatically receives a ticket and an additional chance of winning one of the spectacular prizes on offer in the draw. 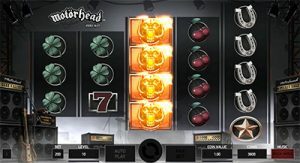 Rock fans will love the Motorhead slot, featuring a loud soundtrack which you can select yourself by choosing between four of the band’s most famous songs, Overkill, Killed by Death, Iron Fist and the crowd favourite, Ace of Spades. The game also features live concert footage, combining the thrill of winning with the excitement of being at a rock concert – all of which is available from the comfort of your own home. Head over to Leo Vegas mobile casino, create an account and get spinning for your chance to share in a stack of special prizes – and who knows, you may even be lucky enough to hit the jackpot.